A bamboo screen makes an excellent feature to bring an atmosphere of privacy and it can trimmed to achieve the desired appearance in garden design. The difference between privacy screens and hedges is screens are taller. I have concentrated on listing the taller species here because they are more suitable. A screen can be cultivated by choosing the right species according to the height you want it to be. Choose a species by first deciding the height and density, branches and size of leaves. Do you want a really tall but not so thick screen? Or would you prefer a lower height with larger leaves? The example species below will make a good bamboo screen. 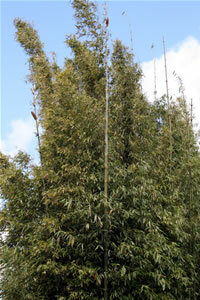 If you are looking for a species suited to hedging please look on my page that focuses on the Bamboo Hedge. I also have a section on Bamboo Windbreak for those of you who live in exposed places! Hibanobambusa Tranquillans 'Shiroshima' - Long cream and white stripe leaves to 10" x 1 1/4" - Maximum height: 16' - Maximum diameter: 1 1/4"
Hibanobambusa Tranquillans 'Shiroshima' - Very rare - Excellent screening or hedging with moderate spreading - 2 branches per node - Variegated cream and white striped leaves may grow up to 10 inches long by 1 1/4 inches wide - Maximum height: 16' - Maximum diameter: 1 1/4"
Indocalamus latifolius 'Solidus' - Very good screening and shade bamboo with aggressive spreading - Leaves are 8 to 10 inches long - Maximum height: 8' - Maximum diameter: 3/8"
Indocalamus tessellatus Tessellatus - Good screening, excellent hedging, moderate spreading, can grow in containers - edible - largest leaves of up to 24 inches long by 4 inches wide - Maximum height: 7' - Maximum diameter: 1/2"
Phyllostachys aurea 'Golden bamboo' or 'Fishpole Bamboo' - Excellent for a bamboo screen, good for hedging and container - spreads aggressively in areas with warm summers - edible - Culms used for fishing rods, walking sticks, umbrella handles, crafts projects, and interior decoration - Maximum height: 27' - Maximum diameter: 1 3/4"
Phyllostachys bissetii 'Dwarf Bisset' - Excellent screening and hedging with a very aggressive spread and vigorous growth - early shooting in spring - Used for handicrafts, tools, and splits can be woven - Maximum Height: 18' - Maximum Diameter: 1"
Phyllostachys flexuosa 'Zigzag Bamboo' - Excellent screening and hedging with aggressive spreading - some culms show a zigzag pattern - edible - branches and leaves appear more open than other species - used for woven bamboo projects, pipes, and fishing rods - Maximum height: 31' - Maximum diameter: 2 1/4"
Phyllostachys heteroclada 'Solidstem' - Excellent screening and good for hedging with aggressive spreading - edible - suitable to grow in wetter climates - Maximum height: 24' - Maximum diameter: 3/4"
Phyllostachys nigra 'Hale' - Excellent for a high branching bamboo screen - moderate spreading - hardier than some species - turns black sooner than other species - Maximum height: 20' - Maximum diameter: 1 1/2"
Phyllostachys aureosulcata f. spectabilis - Cold hardy ornamental bamboo that can achieve a height of up to 30' with a culm diameter of 1-2". Phyllostachys parvifolia is a cold hardy clumping bamboo, green culms that grow straight and vertical to achieve a height of up to 40' with a culm width of approximately 4". Pleioblastus chino elegantissimus - Good screening and excellent hedging with a moderate spreading - green leaves with thin white stripes varying in lengths - Maximum height: 10' - Maximum diameter: 3/4"
Pleioblastus chino 'Murakamianus' - Good screening and excellent hedging with moderate spreading - variegated leaves with white stripes - Maximum height: 10' - Maximum diameter: 3/4"
Pleioblastus linearis - Good for screening and makes excellent hedging with aggressive spreading and running - long narrow leaves like grass - sometimes used for roofing - Maximum Height: 14' - Maximum Diameter: 1"
Pleioblastus shibuyanus 'Tsuboi' - Quite rare vigorous growing bamboo - good screening, excellent hedging with very aggressive spreading, also good attractive container and ground cover plant - small varying white or cream striped leaves - Maximum height: 9' - Maximum diameter: 1/4"
Sasa palmata - Good for a bamboo screen and provides excellent hedging - aggressive spreading - also does well in containers and as a houseplant - leaves are leathery and thick and can be up to 15" long by 2 1/2" wide - grows well in cooler climates - Maximum height: 7' - Maximum diameter: 1/2"
Shibataea kumasaca - Good for screening and excellent for hedging with slow spreading - leaves are short and broad - culms have slightly zigzag internodes and prominent nodes - Maximum height: 7' - Maximum diameter: 1/4"
Shibataea lancifolia - Good for ornamental screening and hedging with moderate spreading - longer and narrower leaves than other species - Maximum height: 7' - Maximum diameter: 1/4"
Don't forget to think about fast growth and how you are going to control it if an aggressively spreading species. 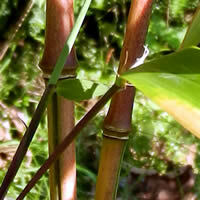 See guide to controlling bamboo. You can also trim the screen down to a desirable height, see trimming bamboo and pruning bamboo.